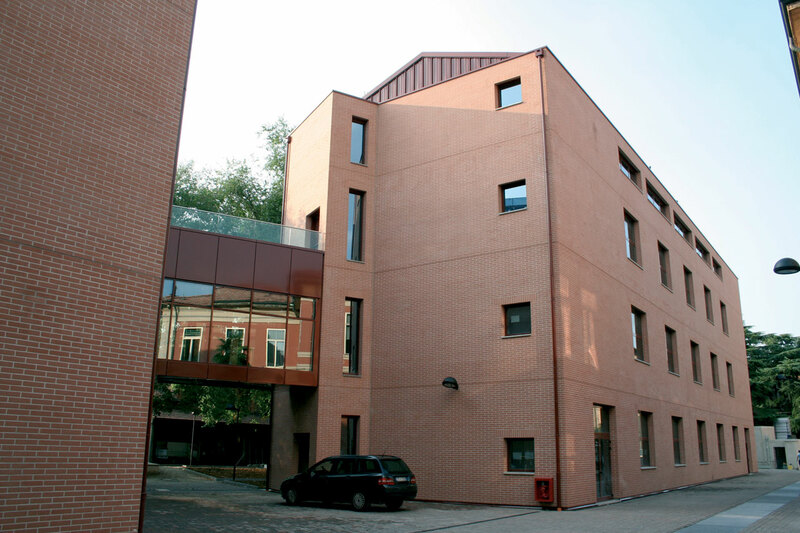 The aim of this project is the realization of a new educational center for the Law Faculty of the University of Bologna, essentially made up of two buildings, named Building “A” and Building “B”. The three floors of building A are for didactic use, classrooms and study areas, with a large entrance hall. The four floors of building B are occupied by polifunctional classrooms for the educational center. The unifying design of the complex’s architecture derives from the overlapping and the alternating of opaque massive surfaces with transparent surfaces, capable of developing manifold volumetric articulations and of emphasizing the compositive value of the covering. The external skin is made up of handmade bricks that have been left uncovered, according to the limitations set by the Building Commission on the final project, and is embellished by the refined design of the square windows. The internal courtyard, that is mainly set on the west side, with the purpose of exalting the perception of a garden with it’s internal spaces, is made up of a surface with a strong visual permeability.